By all accounts it sounds like it was a great day on Salisbury Plain this year on the ocassion of the now annual Imberbus event. Unlike 2014 when the heavens opened, Walter Wall & his Sunshyne Band were in attendance and blessed the organisers and visitors alike with a good weather day. That said, around 5.00pm precipitation did occur, by then though the event was all but over. 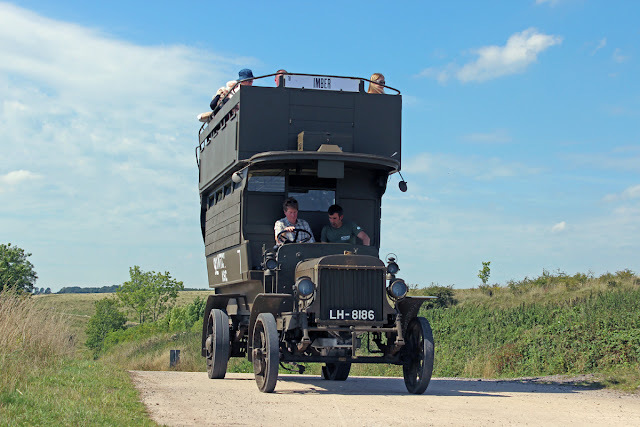 The following set of images provided by Roger Kaye hopefully provide a flavour of the event and may encourage others who have yet to venture to the West Country, to visit in 2016. 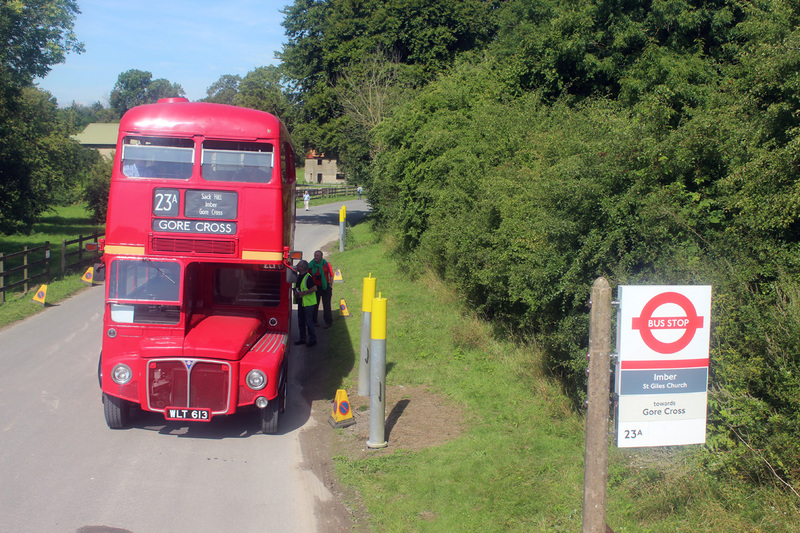 Routemasters RM 1978 and RML 2735 illustrate the respective end to end destinations of route 23A that provided a link to the 'outside' world at Warminster Station. 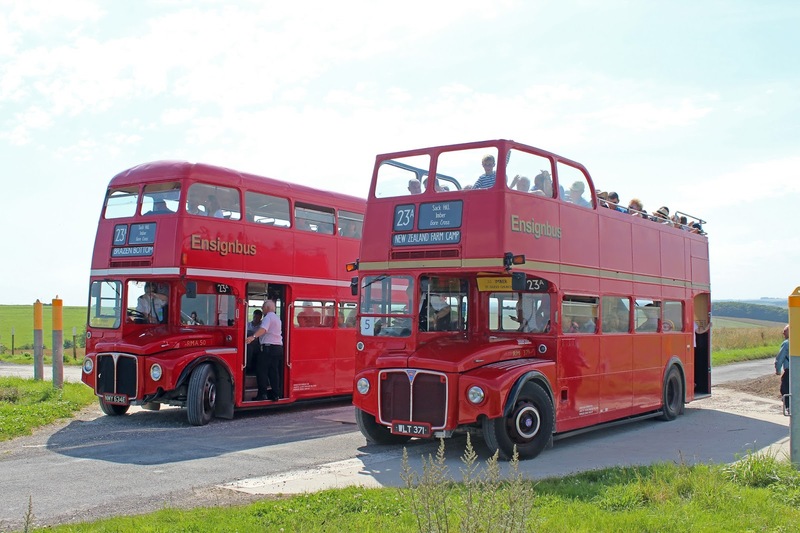 Two buses (upper and lower) were provided by the Newman family owner operators of the well known Ensignbus company at Purfleet in Essex. 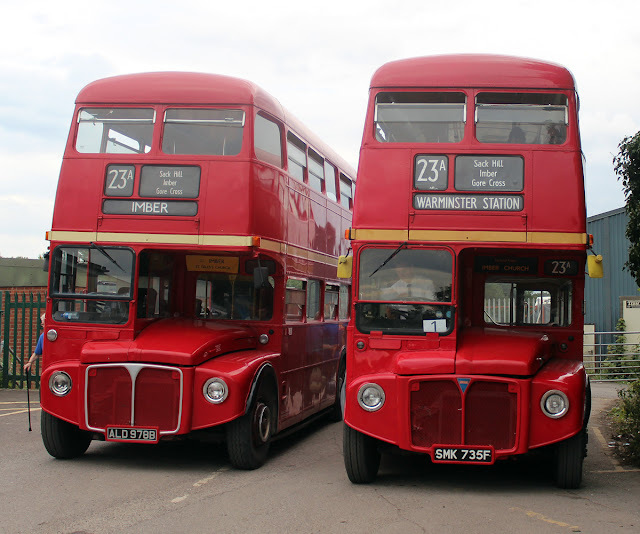 RMA 50 on the left was one of 65 front entrance versions acquired to provide a service for British Airways at Heathrow Airport and operated a service between there and a terminus in West London, which linked in with the London Underground, long before it was extended into the airport. 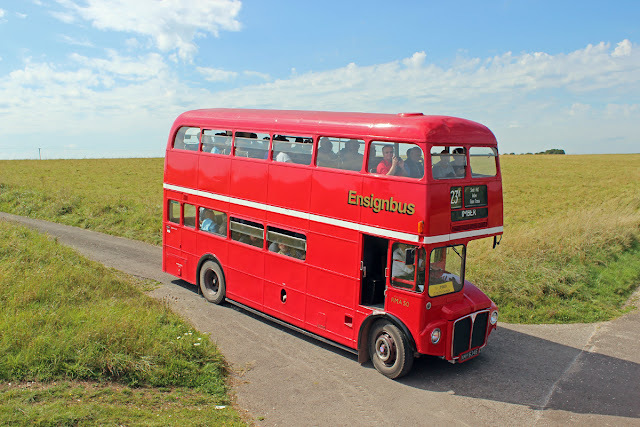 Alongside is standard length Routemaster RM 371 which at some stage was converted to open-top for the Round London Sightseeing Tour. 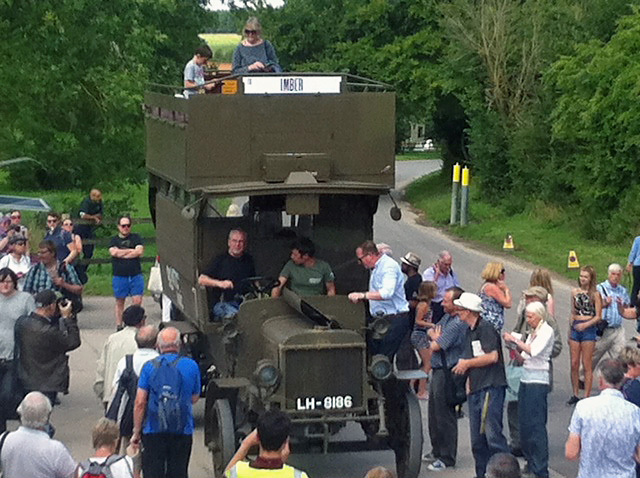 Whilst the buses were well filled, the open-topper obviously proved popular in the weather conditions. 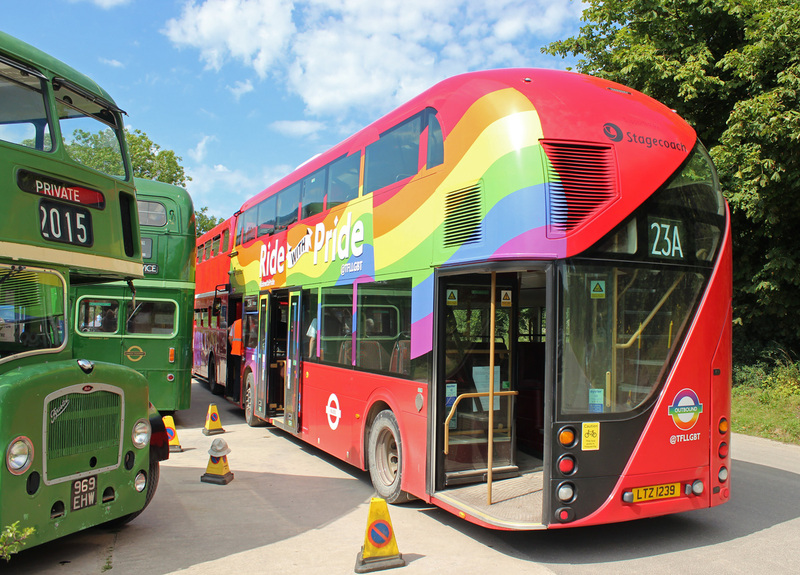 Both buses are now operated alongside the vast fleet of other buses in the Ensignbus fleet on a variety of services and duties. RMA 50 does a reverse turn at Littleton Down because at the last minute the organisers found that the turning area around New Zealand Farm Camp was closed for roadworks so had to turn short. The road the bus has reversed into actually leads to the MoD Portaloo store, but the organisers were not quick enough to get blinds made up for that ! 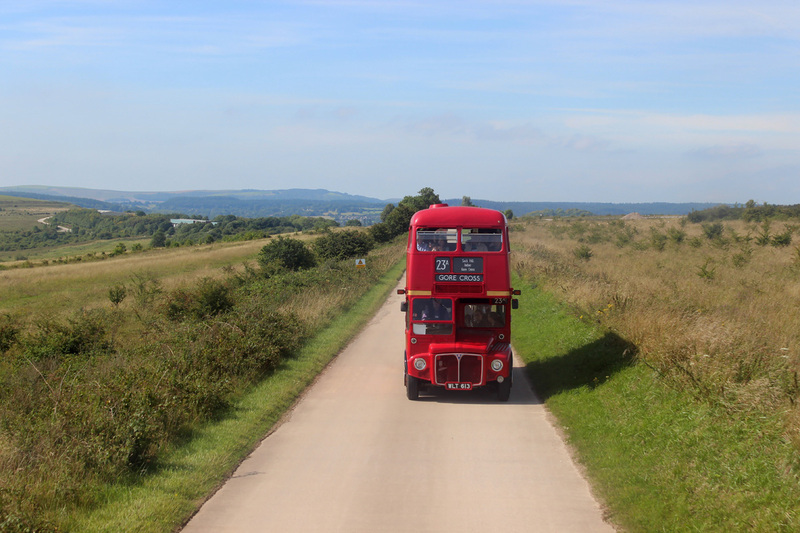 Another standard length Routemaster was RM 613 seen here in the upper image bound for Gore Cross. At the helm Sir Peter Hendy CBE, the once Commissioner for Transport for London, but now the current chairman of Network Rail. He has been very much at the forefront of this once a year operation. 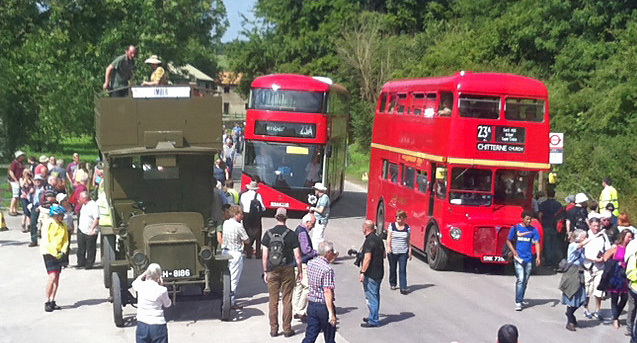 Below the bus is shown at the now uninhabited village of Imber, all part of the vast training grounds for the British military. Look at that. You wait for a year and then two dolly stops come along at once. Here RML 2735 awaits time before departing on another run on the service to Warminster Station. This was one of the longer 30-foot versions of the Routemaster capable of seating 72 passengers. 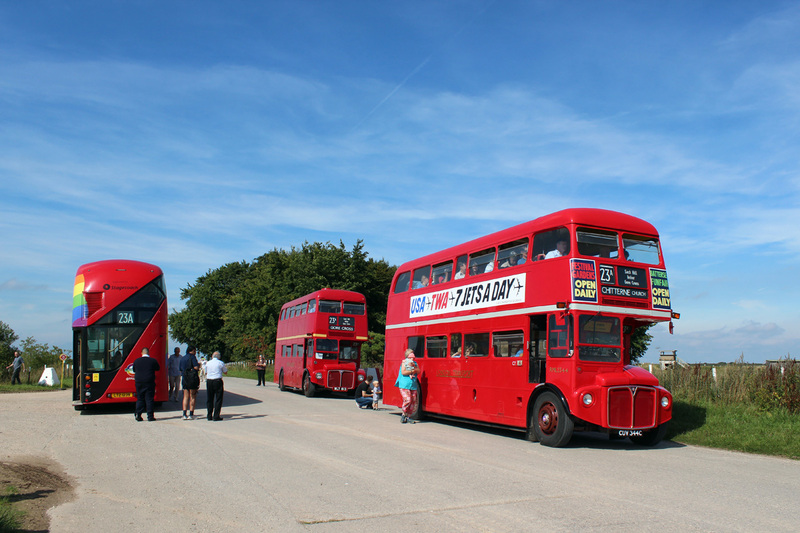 Standard Routemaster were 27 foot 6 inches long with seating capacity for 64 passengers. 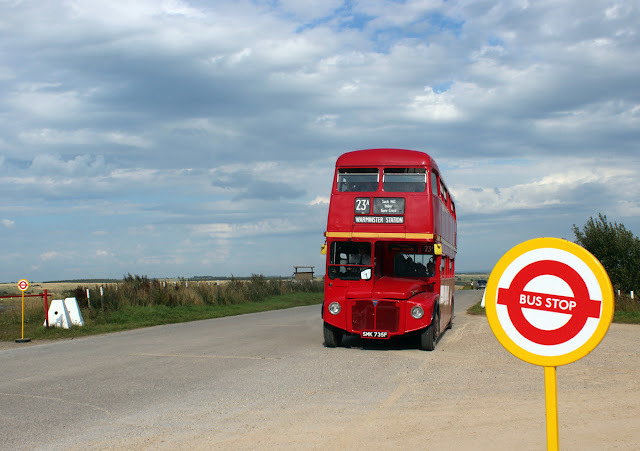 But now we have a 'New Routemaster' on revenue-earning duties or as some refer to it, the 'Borismaster'. 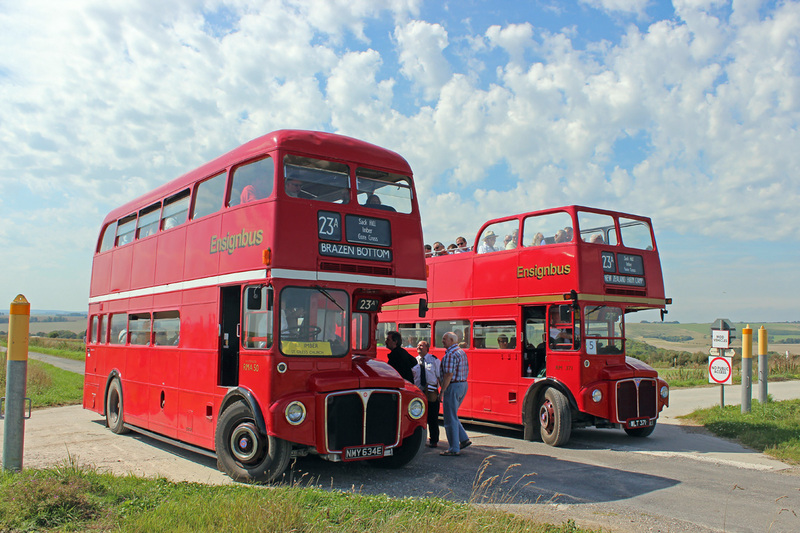 With seating for 62-passengers plus 19 standing, it is longer than the RML at 11.3-metres. Much has been written and already said elsewhere about this vehicle, so there is no need for any of that to be repeated here. However, Londoners are currently experiencing an explosion of allover advertisements of a growing number of their buses, none moreso than the 'New Routemaster'. Amongst all the commercial advertisements though, this one perhaps stands out the most, being in the 'rainbow' colours for the LGBT (lesbian, gay, bisexual and transgender). No doubt it brightens up some of the dour London streets. 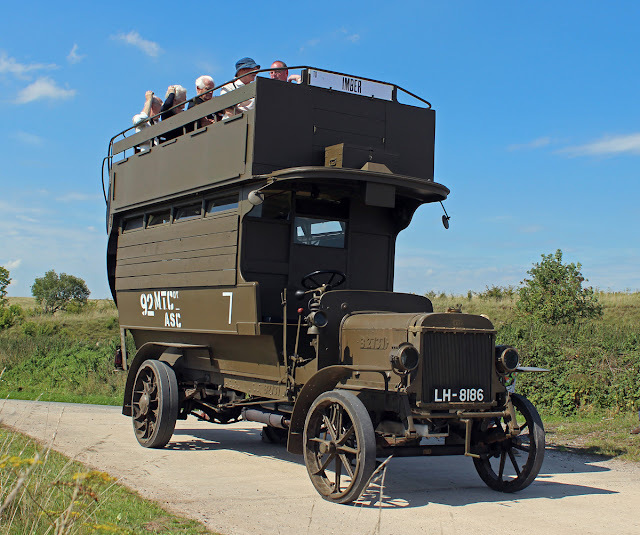 After all the years of Routemaster operation from the 1950s to the present day, the organisers sprung a complete surprise in the shape of the 'Battle Bus'. London B-type bus B 2737 was converted into a camouflaged First World War 'Battle Bus' to commemorate the centenary of the commencement of hostilities in 1914. The bus had been one of commandeered by the War Department for overseas duties, few of which returned unscathed to these shores. 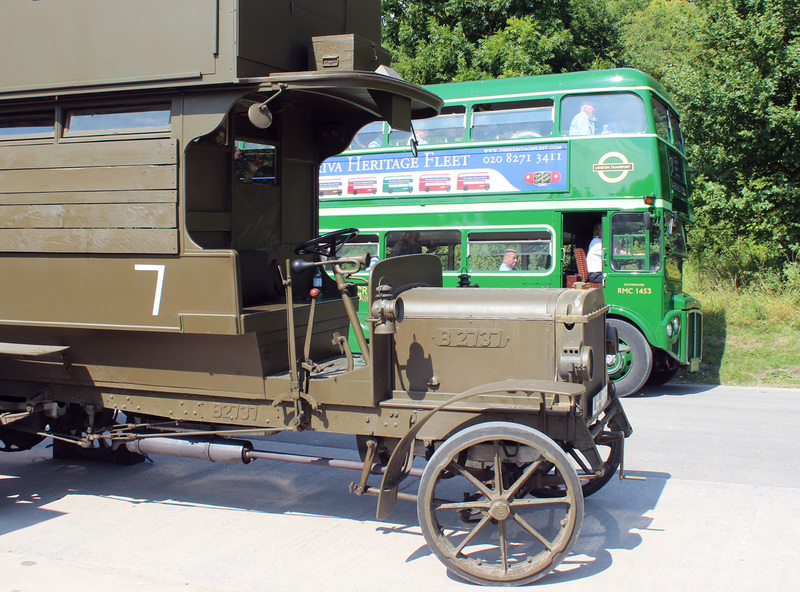 The vehicle is part of the London Transport Museum's fleet and makes regular forays to events especially around Southern England. Some of the visitors to the event were priviliged to experience a ride on the bus, shown here in the wilds of the back of beyond in the middle of Minitry of Defence property on Salisbury Plain. Perhaps time for a caption competition. Our suggestion would be "Have you any idea how to get the thing going?" And another "Where do I plug in the diagnostics?" Finally a couple of images courtesy of regular attendee and bus conductor Brian Bell. Sir Peter got in on the act of course, well why not. Here he prepared to take the 'Battle Bus' off on a run in the company of the Eastern England Traffic Commissioner. Well they are allowed a day off work now and again for a bit of a Busman's Holiday. 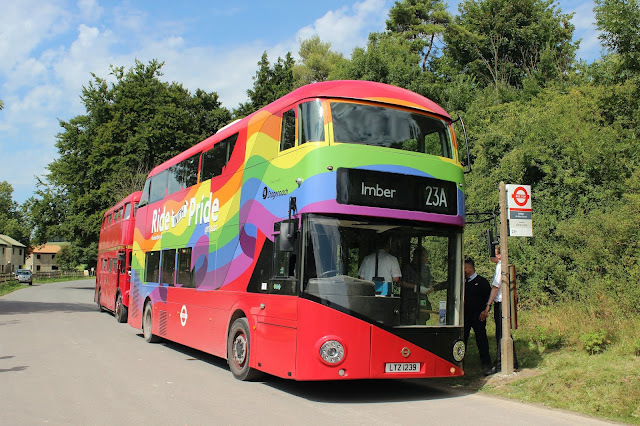 But of course as we close with this final image, there is a serious side to all the fun and frolics of Imberbus. As illustrated here people from all walks of life attended and hopefully having enjoyed themselves felt encouraged to give generously to those collecting for charity. 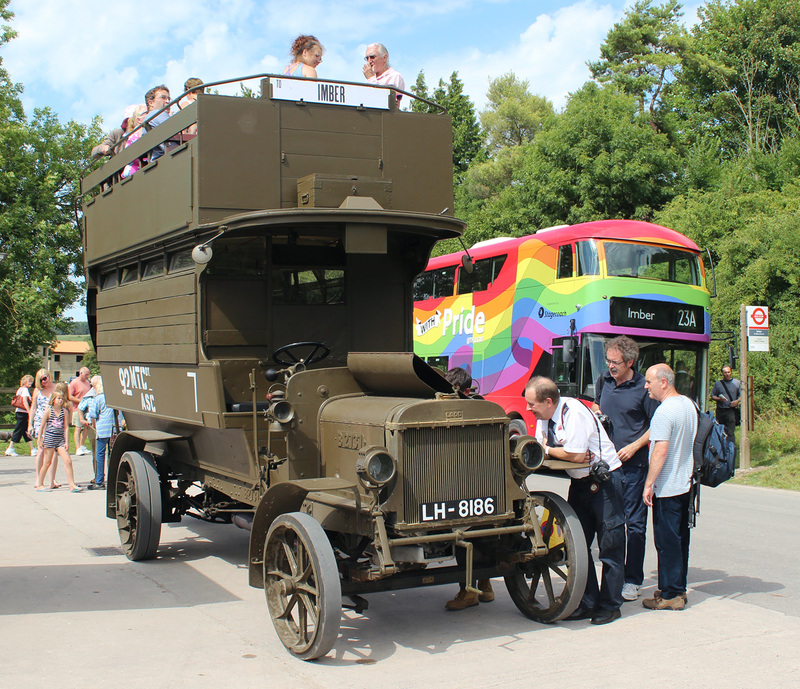 The charities are The Friends of St.Giles Church, Imber and the Royal British Legion. Thanks must go though to the organisers and the army of volunteers who have helped to make this event what it is since established in 2009. Long may it continue.